Objective To evaluate the change in incidence rates of road traffic disabilities from 1980 to 2005 in China. Methods We employed the 2006 China National Sample Survey on Disability to derive weighted number of persons with disabilities resulting from road crashes and weighted age-gender-specific population at risk by disability occurrence year. The annual incidence rate of road traffic disabilities and corresponding 95% CI were estimated. We used the World Population Prospects (WPP) and the death rate of people with disabilities (PWD) to estimate potential earlier loss of lives before 2006. Both WPP-adjusted and PWD-adjusted incidence rates of road traffic disabilities were further adjusted using the life table analysis. 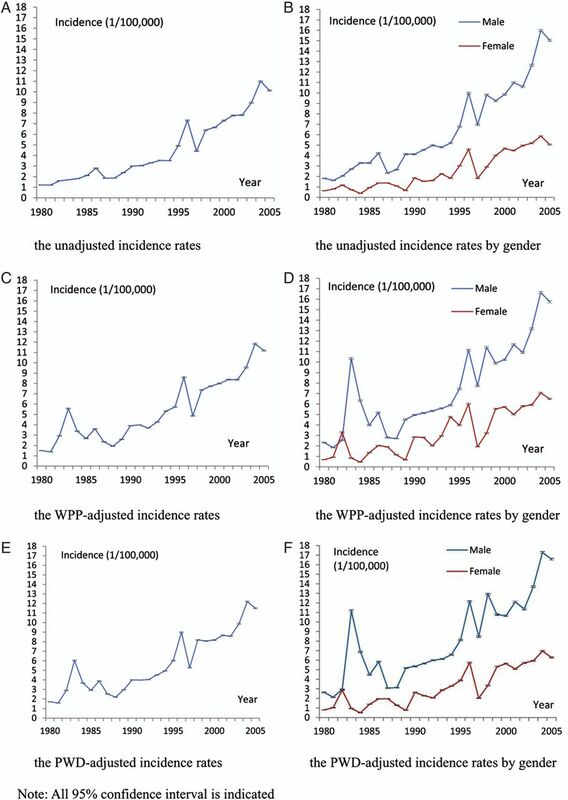 Results The WPP-adjusted incidence rate for road traffic disabilities increased over time from 1.50 (95% CI 1.47 to 1.52) in 1980 to 11.19 (95% CI 11.13 to 11.25) per 100 000 persons in 2005. The PWD-adjusted incidence rate also increased from 1.71 (95% CI 1.68 to 1.73) to 11.51 (95% CI 11.45 to 11.57) per 100 000 persons. Conclusions Road crashes disable thousands of Chinese and remain a significant population health and development problem. The increasing burden of road traffic disabilities calls for more efforts and specific strategies to improve road safety in China. This is the first study presenting an overview of the annual incidence rate for road traffic disabilities over two decades in China using a nationally representative survey. The unadjusted and adjusted findings consistently demonstrate that road traffic disabilities are an emerging population health problem in China. When applying life table analysis, we estimate annual age–gender-specific survival probability by interpolating the average difference between two adjacent values, which may be somewhat optimistic for persons with severe disability. Although we used the life table analysis to adjust for potential early-life losses among persons with road traffic disabilities, the disability incidence estimates may still be underestimated. Considering rapid motorisation is underway with an increase in the number of civilian motor vehicles by 17-fold during 1980–2005 from 1.8 to 31.6 million in China,10 road crashes remain an important population health problem.1 Compared with previously reported 243% increase in road traffic mortality in the late 1990s in China,4 a 27% decrease using police-collected mortality statistics during the period of 2002–2007 was revealed.11 Arguably this down turn in road traffic deaths may not comprehensively reflect road safety gain in China when comparing with a non-significant 8% increase of road traffic injuries using hospital registry statistics from 2002 to 2007.11 Nevertheless, any estimation of incidence change over time in terms of road traffic disabilities (RTDs) has not been attempted. In this study, we aim to estimate the annual incidence rate of RTDs between 1980 and 2005, and the finding may provide additional evidence to complement previous studies on the burden of road traffic injuries in transitional China. As disability may generally refer to impairment in sensory or mobility functions, limitation in movements or activities or restriction in social participation, it may be defined using various diagnostic tools.14–17 In the survey, diagnostic manuals including the International Classification Functioning, Disability and Health (ICF), the 10th edition of International Statistical Classification of Diseases and Related Health Problems (ICD-10) and WHO Disability Assessment Schedule 2.0 were used to define different types of disabilities and disability severity where appropriate. For the current study, we selected study participants as persons with physical and/or intellectual disabilities caused by road crashes. The current study dataset has no unclassifiable values for focused variables including age, gender, physician confirmed disabilities and underlying primary cause, and age of disability occurrence. is the age-specific-weighted population in China. refer to the same denotation in formula (1). are the same denotation in formula (1). Table 1 presents an example of calculating the WPP-adjusted incidence rate of RTDs among women between 20 and 49 years of age in 1981 (table 1). Considering the survey design, we constructed sample weights using standard weighting procedures and used SAS SURVEYFREQ procedure to estimate 95% CIs of the number of persons with RTDs. Applying the lower and upper CI limits in the formulae (1)–(3) resulted in corresponding 95% CIs for unadjusted, WPP-adjusted and PWD-adjusted incidence rate estimates. , also increased over time from 1.71 (95% CI 1.68 to 1.73) in 1980 to 11.51 (95% CI 11.45 to 11.57) per 100 000 persons in 2005 (figure 1). Annual incidence rates of road traffic disabilities (per 100 000) in China 1980–2005. for men increased from 2.32 (95% CI 2.28 to 2.37) in 1980 to 15.75 (95% CI 15.66 to 15.85) per 100 000 men in 2005, whereas the rate for women increased from 0.69 (95% CI 0.67 to 0.71) in 1980 to 6.49 (95% CI 6.43 to 6.55) per 100 000 women in 2005 (figure 1). We found a significant increase in the incidence of RTDs among the Chinese population, with the number of civilian motor vehicles increasing from 1.8 million in 1980 to 31.6 million in 2005, corresponding to a growth from 1.81 to 24.16 vehicles per 1000 population.10 Road crashes have become one of the leading causes of death and years of life lost in China recently.23 ,24 Furthermore, the most recent estimates of 3.2 million years of lost productivity9 and 14.96 million disability-adjusted life years (DALYs)24 were attributed to road crashes. Many road safety initiatives have been established in China, such as the official recognition of road safety as a national public health need25 and the introduction of compulsory seat belt use in 2004.26 Although road traffic mortalities decreased during the period 2002–2007, this may be more due to the incompleteness of the data collection rather than robust safety gain.11 As such, the current study finding of an increasing trend in RTDs reinforces that continuing efforts should be invested to improve road safety in China. The study finding of increasing incidence rates in RTDs is consistent with the previous finding of an 8% increase of hospitalised non-fatal injuries resulting from road crashes in China.11 There are many reasons that may contribute to this increasing trend of RTDs in China, such as lack of enforcement of traffic regulations,27 ,28 changing sociocultural patterns including risk-taking behaviours29 ,30 and lack of use protective gears such as helmets.27 ,29 ,31 ,32 However, we could not examine this as information such as crash locations and use of protective gears were not included in the survey. Future studies may examine the association between disabling outcomes and various influential factors in a crash. In China, the compulsory road safety legislations include regulations to mandate use of seat belts, safe travel speed and zero tolerance of drunk driving. Since May 2011, drunk driving has been elevated to a criminal offence.28 Considering that legislation enforcement could provide immediate safety benefits more quickly than any other single safety measure,37 intensive enforcement activities are expected to reduce the incidence of road trauma including deaths and disabilities to some extent. Despite these existing legislations and their enforcement in China, further efforts are warranted in terms of issuing new road safety initiatives such as compulsory child restraint use and helmet use for vulnerable road users. A major limitation of this study was the estimation of deaths among disabled populations. Although we used the life table analysis to account for the early-life losses among persons with RTDs before 2006, the disability incidence estimates may still be underestimated as a person with RTDs may bear a higher risk of dying of diseases compared with the general population, and thus was not recruited in the survey. Another limitation was the use of binary disability categorisation. Although this binary categorisation was widely applied to various study settings,13 ,38–44 it counted disabilities with the lowest severity the same as those with the highest such as paraplegia. Consequently, the policy implication should be interpreted with caution because crash victims with different levels of disability severity may have different levels of impaired functioning in society. Nevertheless, the study results by disability severity indicated an increase in incidence of all severity categories, and thus the current finding that the incidence of RTDs has increased over time in China was sound. Other limitations include interpolating the average difference between two adjacent values when applying life table analysis such as the calculation of annual age–gender-specific survival probability, which may be somewhat optimistic for persons with severe disability; and the use of generic diagnostic manuals to define disabilities, which may result in incomplete capture of persons with disabilities as evidenced in terms of prevalence variation between countries. Although these limitations may further underestimate the incidence rates we calculated, the adjusted results indicated a similar finding of an upward trend for RTDs in China. Therefore, the study findings are reliable but somewhat conservative. RTDs have become a significant population health problem in China. Further efforts to reduce RTDs are warranted. Future road safety initiatives may focus on translating established effective injury countermeasures into local settings to save lives, prevent disabilities and other injurious outcomes resulting from road crashes in China. The authors thank the provincial and municipal federations of disabled people for their support in data collection and management. WHO. Global status report on road safety: time for action. Geneva, Switzerland: World Health Organization, 2009. World Bank. Confronting ‘Death on Wheels’: making roads safe in Europe and Central Asia (Report No. 51667-ECA). Washington: The World Bank, 2009.
. Human resources for the control of road traffic injury. Bull World Health Organ 2005;83:294–300.
. The burden of road traffic injuries in developing countries: the 1st national injury survey of Pakistan. Public Health 2004;3:211–17.
. eds. World report on road traffic injury prevention. Geneva, Switzerland: World Health Organization, 2004.
. Estimating global road fatalities (TRLReport No. 445). Crowthorne: Transport Research Laboratory, 2000. Department for International Development. Guidelines for estimating the cost of road crashes in developing countries (Project R7780). Crowthorne, Berkshire: Department for International Development, 2003.
. Productivity losses from injury in China. Inj Prev 2003;9:124–7. National Bureau of Statistics of China. China statistical yearbook. Beijing: China Statistics Press, 1981–2006.
. Comparing road traffic mortality rates from police-reported data and death registration data in China. Bull World Health Organ 2011;89:41–5. Communiqué on major statistics of the second China national sample survey on disability. (In English) Beijing: Leading Group of the Second China National Sample Survey on Disability & National Bureau of Statistics of the People's Republic of China, 2006. http://www.cdpf.org.cn/english/contactus/content/2008-04/14/content_84989.htm (accessed 17 Dec 2013).
. Twenty-year trends in the prevalence of disability in China. Bull World Health Organ 2011;11:788–97.
. The definition of disability: what is in a name? Lancet 2006;368:1219–21. WHO. World report on disability. Geneva, Switzerland: World Health Organization, 2011.
. Recent trends in disability and functioning among older adults in the United States: a systematic review. JAMA 2002;288:3137–46.
. Trends in disability and disability-free life expectancy among elderly people in Spain: 1986–1999. J Gerontol A Biol Sci Med Sci 2005;60:1028–34. WHO. International classification of functioning, disability and health. Geneva, Switzerland: World Health Organization, 2001. United Nations, Department of Economic and Social Affairs, Population Division. World population prospects: the 2010 revision. New York, USA: United Nations, 2011. http://esa.un.org/unpd/wpp/Documentation/publications.htm (accessed 23 May 2013).
. The methods and materials of demography. 2nd edn. San Diego, California: Elsevier Academic Press, 2004.
. Life table techniques and their applications. Orlando, Florida: Academic Press, 1987.
. Death level of persons with disabilities in China. (In Chinese) [dissertation] Beijing: Peking University, 2011.
. Injury-related fatalities in China: an under-recognized public-health problem. Lancet 2008;372: 1765–73.
. Rapid health transition in China, 1990–2010: findings from the Global Burden of Disease Study 2010. Lancet 2012;381:1987–2015. Development and Research Center of State Council. Research on road traffic safety in China. (In Chinese) Beijing: Industrial Economic Research Department, Development and Research Center of State Council, 2007.
WHO. Road safety in the western pacific region. Geneva, Switzerland: World Health Organization, 2009.
. Road-traffic injuries: confronting disparities to address a global-health problem. Lancet 2006;367:1533–40.
. Uncertainty clouds China's road-traffic fatality data. Lancet 2011;378:305–6.
. Road traffic injuries: a major global public health crisis. Public Health 2008;12:1399–406.
. Health and road transport in Pakistan. Public Health 2006;120:132–41.
. The research progress of the intervention of road traffic injury. (In Chinese) Chin J Public Health 2012;5:569–71. , eds. Developing policies to prevent injuries and violence: guidelines for policy-makers and planners. Geneva, Switzerland: World Health Organization, 2006.
. Global mortality, disability, and the contribution of risk factors: global burden of disease study. Lancet 1997;349:1436–42. ETSC (European Transport Safety Council). Seat belts and child restraints: increasing use and optimizing performance. Brussels: ETSC, 1996.
. Seat belt use in Britain under voluntary and mandatory conditions. Proc Am Assoc Automot Med Annu Conf 1983;27:65–75. OECD and ITF (International Transport Forum). Towards zero: ambitious road safety targets and safe system approach. Paris: OECD, 2008.
. Chronic disability trends in elderly United States populations: 1982–1994. Proc Natl Acad Sci USA 1997;94:2593–8.
. Changes in the prevalence of chronic disability in the United States black and nonblack population above age 65 from 1982 to 1999. Proc Natl Acad Sci USA 2001;98:6354–9.
. Longitudinal study of psychiatric symptoms, disability, mortality, and emigration among Bosnian refugees. JAMA 2001;286:546–54.
. Mental health, social functioning, and disability in postwar Afghanistan. JAMA 2004;292:575–84.
. Recovery from disability among community-dwelling older persons. JAMA 2004;291: 1596–602.
. Effect of physical activity counseling on disability in older people: a 2-year randomized controlled trial. J Am Geriatr Soc 2008;56:2188–94. Contributors XZ conceived the original idea for the study; all authors contributed to the conceptual development, literature review, data analysis, critical revision of the first manuscript and contributed to subsequent drafts. Funding National Key Project (973: No. 2007CB5119001), State Key Funds of Social Science (Project Research on Disability Prevention Measurement in China: No. 09&ZD072), National Yang Zi Scholar Program, 211 and 985 projects of Peking University (No. 20020903). Ethics approval The survey was approved by the State Council.